It’s finally back! The Flash‘s second season premiered, and of course we’re going to talk about it. After all, it’s The Flash! And we’ve waited long enough for it to come back! As usual: Spoiler Alert! We will discuss what happened in this episode and what we thought about it, so if you haven’t seen it yet, proceed with caution! You’re still here? Great. Then let’s get started! In our review of the season finale in May, we talked about the huge WTFs we were left with – most notably, the f*cking black hole over Central City. And, of course, we were left wondering what would happen; how do you solve a problem like that? Well, at the beginning of the episode, 6 months have gone by since the “Singularity” (that’s what they call it). 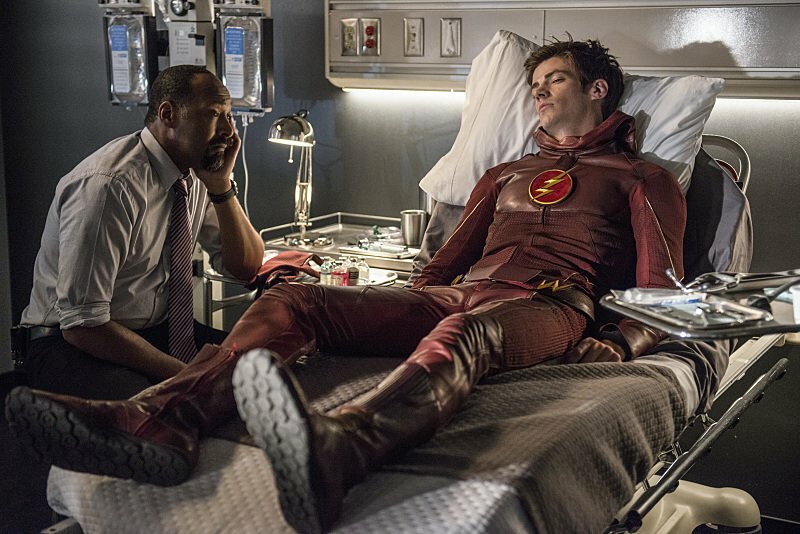 Barry is alone at S.T.A.R. Labs, and we know next to nothing about the rest of Team Flash, because it seems Barry is now working alone. Which, naturally, left us wondering what the hell happened in those 6 months. So that’s why Caitlin left S.T.A.R. Labs. Understable, I’d say. She went to work at Mercury Lab for that reason, which might come in handy at some point (spoiler alert: it does). We also learn that Cisco is now working with Central City PD, being the scientific advisor for the Metahuman Task Force. Joe is, of course, the boss of said task force. So that’s where Cisco went. Iris is still working as a journalist, still mourning Eddie. That, too, is understandable. But she and Joe talk about the fact that Barry keeps pushing everyone away, now preferring to work alone, because at least he won’t get anyone else killed that way. He blames himself not only for Ronnie’s and Eddie’s death, but also for the entire Singularity – and although he might not be wrong about it being his fault, there is no gain in blaming himself and hiding in shame. Barry has also started rebuilding the small businesses and stuff that were destroyed by the Singularity. He does it at night, as though he doesn’t want anyone to even know about it, but of course, such a thing does not go unnoticed, and Iris wants to write an article about it; but Barry asks that she doesn’t, which is sad. Depressed Barry is really depressing. Now, the plot: 6 months after the Singularity, there is a rally. And a “Flash Day“. Which is awesome. 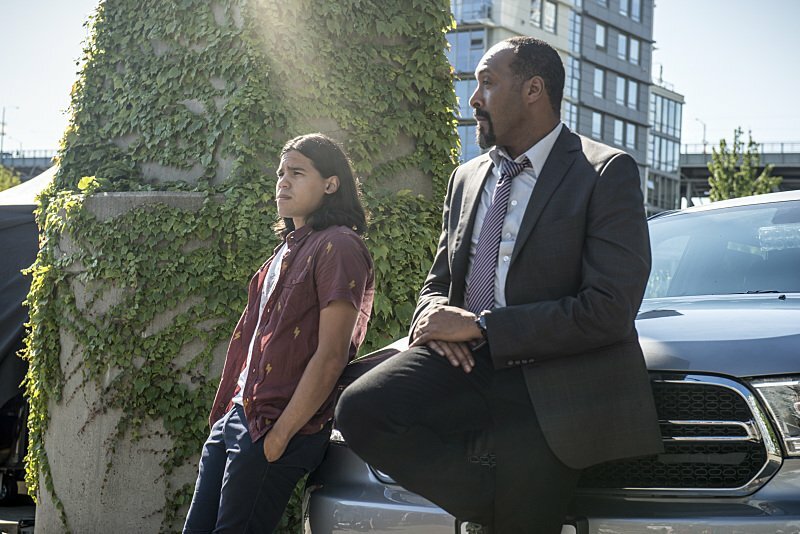 It’s supposed to be a day to honor the Flash, and the mayor gives the Flash the key to Central City – but, naturally, it takes a lot of convincing from Joe and Iris to even make Barry go to the rally and accept the Key. Things never go as planned, of course, so the rally is interrupted by a Metahuman who, we learn later on, uses radiation to make himself stronger and bigger. Like, he can make himself twice his normal size. Professor Stein attributes him the name “Atom Smasher“, which earns him a hug from Cisco (that was cute). Barry goes against the Atom Smasher alone once again, and loses, again. Only then does he reluctantly accept the help of the former Team Flash. Together, they lure the Atom Smasher into a trap – by using a freaking Batsignal!, only I guess it’s a Flashsignal in this case – and defeat him. But before he dies, he explains to Barry that someone called Zoom promised to take him (Atom Smasher) home – if he kills the Flash. And ta-da! We have a new supervillain for the season. Now, there’s a super important side-plot as well: Harrison Wells (well, Eobard Thawn) left S.T.A.R. Labs to Barry, but he can only actually have it if he watches a video on a flash drive that Wells’ attorney shows Barry. Barry and Caitlin watch the video together, and turns out it’s *drumroll* Wells confessing to murdering Barry’s mother! With that confession, Henry Allan is finally freed from prison. There’s an adorable welcome-home party for him at Joe’s place, with Cisco, Caitlin, Professor Stein and his wife, Joe and Iris and Barry of course, at the end of which Henry tells his son that he doesn’t want to stay in Central City. Bummer. Understandable, but still – bummer. We were looking forward to more Barry-Henry scenes, but I guess you really don’t always get what you want. 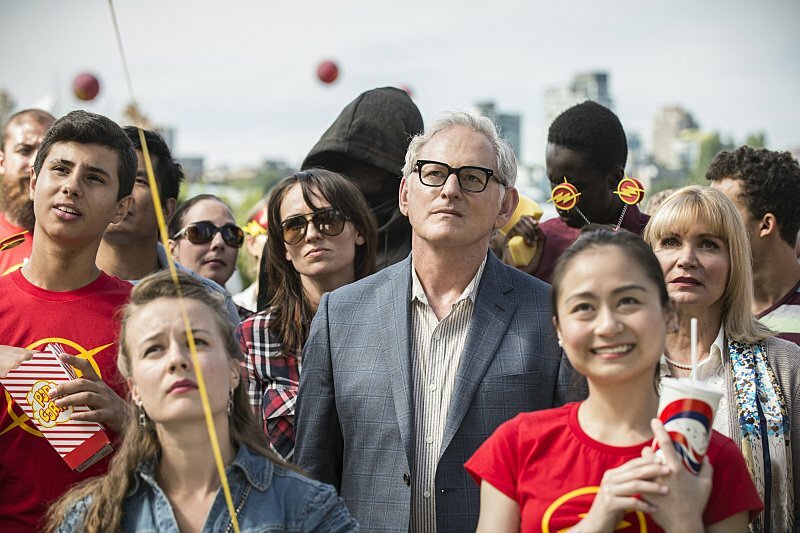 Now, at the end of the episode, we see Team Flash – which now includes Professor Stein – back at S.T.A.R. Labs, now owned by Barry and made more secure by Cisco, when a man that we’ve seen following Barry throughout the episode. 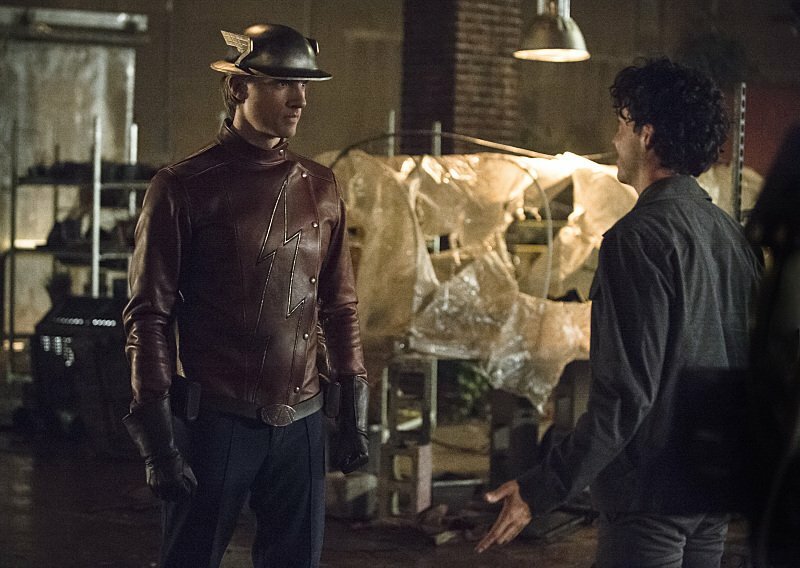 He introduces himself and Jay Garrick (Easter Egg!! )- and the episode ends with the words “your world is in danger”. That last sentence alone makes this episode one hell of a start into the new season. But, and we need to say this, the tone of this episode is a bit different from what we’ve gotten used to last season. We’re not saying that’s a bad thing; it’s just something we’ve noticed. Barry’s a lot less adorkable, and although there’s still a lot of humor, it seems that the general tone is a bit darker than what we’ve seen in season one. I don’t know whether they intend on keeping that tone up, or if they’ve just used for this one episode – I guess we’ll have to wait and see. The acting is great, as it has always been, although there’s some really cheesy lines – but they’ve always been there too, so it’s fine. And not too much, thank god. Okay, so, verdict: Exceeds expectations. It wraps up the whole Reverse Flash/Eobard Thawn/Harrison Wells-thing nicely, explains how they handled the Singularity, but also moves on to new villains. There’s time to grieve the character’s we’ve lost, but it’s not shoved down our throats. 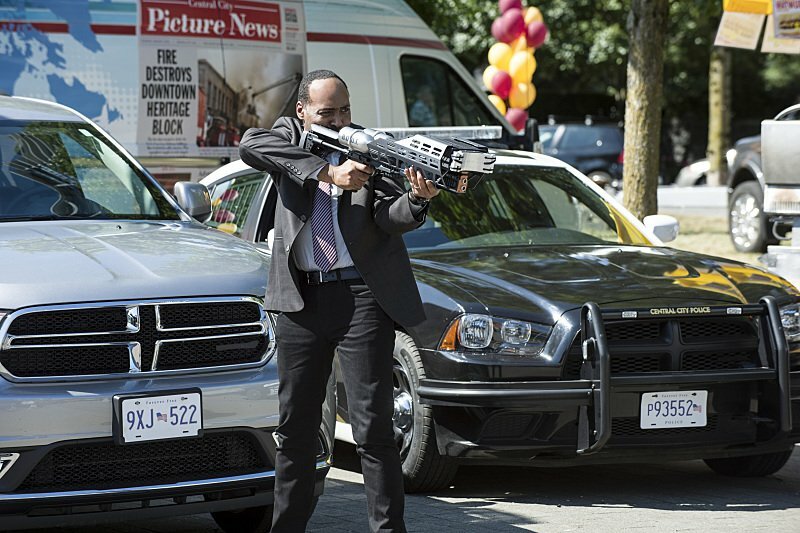 It’s just generally a nice piece of television, which is what we’ve come to expect from the Flash. They have not let us down with this season premiere.